There is something I really don't like when I purchase a device… Being limited by virtual boundaries restricting the potential use for me of that device. Something made by the vendor just for his sole profit and not for the benefit of his customer. Apple is going more and more in that direction regarding their audio player devices (Apple locks free software). Why are all those audio player targeted to one specific "e-music" platform with those bloody DRM locks causing only trouble to legitimate users ? In such jungle, what is a good audio player ? Something flexible enough to install rockbox, a vendor respecting their customers and respecting the free software community. There are some but the hardware is often outdated or not anymore supported. Except for one vendor : sandisk gave hardware to the rockbox project. The negative point is they just gave hardware without documentation. So the rockbox guys made some reverse engineering… This is not perfect but looks at least better compared to the behavior of the other manufacturer. 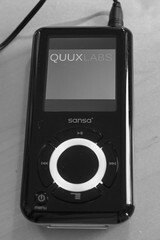 I purchased the sansa e280, I just hope that sandisk will work in the future to directly support the rockbox firmware.